New Jersey Gov. 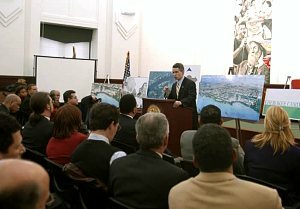 James McGreevey (at podium) announces the $1.1-billion redevelopment plan before a packed house at Camden's City Hall. CAMDEN, N.J.  "'The stone the builders rejected has become the capstone'," New Jersey Gov. James E. McGreevey (D) quoted from the Bible. " 'The Lord has done this, and it is marvelous in our eyes'." In just about anybody's eyes, it is surely striking. McGreevey was announcing a US$1.1-billion redevelopment plan for Camden, N.J. (http://ci.camden.nj.us), one of the nation's poorest cities. And the largely private remaking of Camden's Cramer Hill neighborhood - where annual per-capita income doesn't even reach $10,000 - will create almost 1,600 new permanent jobs. "It's the biggest project in the history of this city, or maybe any other city," Mayor Gwen Faison enthused during the plan's unveiling. A private-sector player - Raleigh, N.C.-based Cherokee Investment Partners (www.cherokeefund.com) - is bankrolling most of Camden's big project. The company is creating a brand-new division, Cherokee Camden, that will invest $1 billion in the South New Jersey redevelopment. "We wouldn't be here if not for the commitment of the state and the community, and the upward momentum we see in Camden," said Cherokee Investment Partners CEO Thomas Darden (pictured). Cherokee aims to transform Cramer Hill into a city within a city. The company will convert the neighborhood's 450 acres (180 hectares) into a mixed-use development that will include 5,000 new homes; more than 500,000 sq. ft. (45,000 sq. m.) of retail space; a new marina, parks and trails; and an 18-hole golf course created from a closed 89-acre (36-hectare) landfill. "We look for a community that wants us," Cherokee Investment Partners CEO Thomas Darden said at the ambitious plan's announcement. "We wouldn't be here if not for the commitment of the state and the community, and the upward momentum we see in Camden." Not long ago, though, Camden's momentum was spiraling straight down. So much so, that the state unilaterally took over the ailing city in 2002. Under the Camden Municipal Rehabilitation and Recovery Act (MRRA), New Jersey assumed control of the city's day-to-day operations by creating the Camden Economic Recovery Board (ERB), a subsidiary corporation of the New Jersey Economic Development Authority (EDA at www.njeda.com). The takeover is part of the state's five-year plan to oversee Camden's comprehensive revitalization. That strategy, however, obviously steamed some local officials. "When the governor signs the bill, it's a declaration of war," City Council member Ali Sloan El declared at a public meeting in Camden. The Cramer Hill project will create $20 million a year in new property-tax revenues, alone more than the total property taxes currently paid in Camden (pictured), one of the poorest U.S. cities. McGreevey, however, saw a sunnier future. 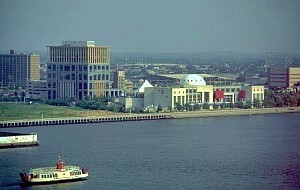 "Camden may be one of the poorest cities in America," the governor said after signing Camden's rehabilitation design in July of 2002. "But it is the richest when it comes to location and transportation assets, as well as being better positioned than any other city in the nation for the burgeoning smart growth and new urbanism movements. "Camden," McGreevey pledged, "is on the verge of an explosive, dynamic renewal."  $18 million in state funding for a plan that will renovate and expand Camden-based Thomas H. Kean New Jersey Aquarium and bring in $135 million in private investment to the nearby riverfront.  August 2003's announcement that Nutsco, one of the world's largest cashew producers, is bringing a $3-million processing facility to Camden's waterfront.  October 2003's opening of the city's Victor Luxury Waterfront Lofts, which are 80 percent privately funded.  A $437-million, 10-year state award to Camden's school system to build 15 new schools and renovate nearly two dozen more. Cherokee's Cramer Hill redevelopment plan, though, kicks Camden's renewal into a higher gear. It will create the city's first large-scale development of new market-rate housing in more than four decades. What's more, it will generate $20 million a year in new Camden property-tax revenues. That alone is more than all city property owners currently pay in annual property taxes. "It's moving from dependency to self-sufficiency," McGreevey said of the new tax revenues. State takeover funding was a key factor in securing Cherokee's billion-dollar commitment. "Did we do it?" Camden Mayor Gwendolyn Faison (pictured) repeatedly called out to the crowd during her remarks at the project announcement. Said the crowd each time, "Yeah!" Cherokee's Camden redevelopment will require between $110 million and $125 million in public investment, Darden estimated. Most of those funds will be used to build a new bridge that will strengthen Cramer Hill's access, connecting it to the Camden-to-Philadelphia Route 30. "The Cherokee Camden project is a perfect example of the way we're using public-private partnerships to build neighborhoods, create opportunities, and put people back to work," McGreevey said. Cherokee already has a successful New Jersey redevelopment under its belt. The company's first brownfield project was in Elizabeth, N.J., where Cherokee bought land and developed the $360-million Jersey Gardens outlet mall. Opened in 1999, the mall won a 2001 EPA award for brownfield redevelopment excellence. Significant employment opportunities are a major part of the Cramer Hill redevelopment. The project will create 1,570 permanent positions, as well as 5,000 construction jobs, McGreevey estimated. Cherokee's Darden said that the city's low-income residents would get preference for the construction jobs, with other Camden residents next in line. And Cherokee, he added, expects its project contractors to hire 30 percent of new workers from the city's population. The job openings will be welcome news in Cramer Hill. The largely Hispanic neighborhood registered per-capita income of less than $9,000 in the 2000 U.S. Census. That statistic isn't an anomaly in Camden. More than one-third of the city's residents live below the federal poverty line, and only some 28 percent of Camden adults have at least a high school diploma. The Cramer Hill renovation, however, has some sticky wickets left. One of the biggest is the 700 neighborhood families that the project will relocate; most live in apartment complexes. Eager to avoid upscale gentrification, City Council President Angel Fuentes has sworn to closely monitor the relocation. "Those left behind had the wherewithal to stick it out with their families and continue to reside to this day in Cramer Hill," Fuentes said, citing many former residents' flight to the suburbs. "They are to be respected and commended." One factor, though, will likely boost the project's grassroots support. The design incorporates input from community planning by the Cramer Hill Community Development Corp. (CHCDC), a coalition of 12 civic groups trying to revitalize the neighborhood. Affordable housing, one of the CHCDC's concerns, is part of the plan. Twenty percent of the 5,000 new homes will be subsidized and reserved for low-income residents. Darden estimated that it will take six months to create a final redevelopment plan and secure permits. The project should break ground in about a year, he projected. Even so, some residents remained skeptical. A somewhat similar Cramer Hill redevelopment plan fell apart in the 1960s after funding didn't materialize. "I've seen this show before," Mangaliso Davis, chairman of the Camden's African-American Advisory Committee, said at the project announcement. But the project has engendered hope, an often rare resource in Camden. "We had a vision of a city on a hill where children would be educated and there would be economic opportunities and jobs," said McGreevey. "Let's achieve it."